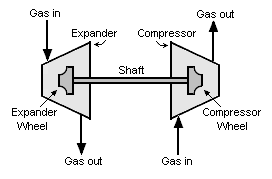 …also referred to as a turbo-expander or an expansion turbine, is a centrifugal or axial flow turbine through which a high pressure gas is expanded to produce work that is often used to drive a compressor. I mention this because Emerson’s Randal Doss alerted me to a whitepaper he had put together a few years ago. The whitepaper, Turbo-Expander Case History: Knowledge of Turbomachinery Health Make Process Decisions, describes a problem that occurred in a turbo-expander in a gas processing facility and how information from the process and vibration information from the machine helped explain the problem. In May of 2008, a gas processing facility in Southern Canada commissioned a new 8100 RPM, 1500 HP turbo-expander. This plant has one spare. During the initial commissioning of the machine, the vibration protection monitor tripped the machine offline. With no machinery health monitoring in place, the decision to restart was made, essentially blind. In September 2009, machinery health information was collected on this critical machine and it was discovered that the machine posed a serious risk to production – even though overall vibration levels were only reading 1.4 milPP [peak-to-peak displacement in thousandths of inches]. During commissioning, high vibration of unknown origin occurred, causing the machinery protection monitor to trip the machine offline. All pre-trip archived process and vibration data was reviewed. No visible damage to the machine was apparent, so the decision was made to restart without performing any internal inspection. Elevated overall vibration levels (~1.4 milPP) at the outboard bearing location were noted after restart. The vibration levels were cause for concern, but no apparent process impact was observed, so the decision was made to place the machine in service. …a machinery prediction monitor was installed in an effort to determine the source of the persistent elevated vibration. The prediction monitor was installed utilizing the buffered outputs from the machinery protection monitor, so there was no need to remove the machine from service. …revealed significant sub-synchronous vibration at the outboard bearing location (see Figure 2 & 3). Although the synchronous data appeared stable, the sub-synchronous component was very unstable and caused the vibration levels to oscillate significantly. This vibration oscillation was not indicated by the protection monitor. …the seal purge gas pressure on the outboard honeycomb gas seal was ~1.5 PSI – well below the specified range of 4-6 PSI. This condition was verified by a visual inspection of a pressure gage mounted on the machine. Attempts to raise the seal purge gas pressure were unsuccessful. After thorough review of all the available data, the source of the sub-synchronous vibration was determined to be a condition known as ‘gas whirl’. This is a condition similar to ‘oil whirl’ in a journal bearing. The machine was removed from service for an inspection. The diagnosis was confirmed during a subsequent disassembly inspection of the machine. Maintenance personal suspected the vibration caused the outboard wheel to contact the seal surface and create additional clearance, making it impossible to maintain seal purge gas pressure. The turbo-expander was taken out of service and sent to be rebuilt before additional damage was done. The machinery protection/prediction monitor proved its value and became a permanent fixture on the site. Posted Tuesday, August 20th, 2013 under Asset Optimization, Oil & Gas.